This is the second article in the series looking at book front and back matter. What is a Preface? was the first. Note: As previously stated, this series came about because it was noted, from various comments and observations, principally in social media discussions, there appeared to be a lot of confusion about the differences between some elements of book front and back matter. Regular readers will know a number of surveys were subsequently conduct. The results have shown there is indeed confusion in some quarters. Flash Back: ‘A device in the narrative of a motion picture, novel, etc. by which an event or scene taking place before the present time in the narrative is inserted into the chronological structure of the work.’ (Dictionary.com) This will be: an event that has lead up to the current story; something that is motivating the protagonist or circumstance; an occurrence that sets the scene for the following action; etc. Flash Forward: ‘A device in the narrative of a motion picture, novel, etc. by which a future event or scene is inserted into the chronological structure of the work.’ (Dictionary.com) Sometimes, to make sense of what is happening, readers could do with a hint of where the action is leading. Note: Great care needs to be exercised not to reveal too much otherwise it will act as a ‘spoiler’ and ruin the reader’s experience. If that happens many readers would probably not continue reading. Background: What is the underlying circumstance or situation. This may be where the events are concurrent with the story but not appropriate for inclusion within the main text. For example: Sometimes the historical setting needs to be established to help the reader place the action in context, or it may be a piece of key information, etc. but to include it in the main text would be distracting and diminish the story flow. World Building: Particularly important for fantasy and science-fiction though it may be equally appropriate where action takes place in an unfamiliar district or country. Now What? : Details of an event or action that leaves questions about what will happen next. Only if it will carry the plot and story forward. Follow on (from previous book): Not necessarily a series. 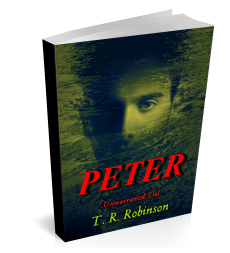 For example: T. R. Robinson is currently in the process of writing a follow up novel to novel ‘Peter’. The prologue enables relevant details, motivations and considerations to be shared so the reader has some degree of understanding as to where the current story has its roots. Hook: It must be pointed out a prologue should NOT be used for this purpose alone. (Hooks really belong in the first chapter.) Nevertheless, if it genuinely forms part of another element (Flash Back; Flash Forward; Background; etc.) there is no reason not to utilise the prologue for such a purpose. Note: Even if included here the, or a, hook should still be included in chapter one. Of course, the above are only suggestions. Some elements may be irrelevant or, and this is more than likely, there may be other aspects authors consider appropriate. The above are simply intended to help authors brainstorm and find elements that fit their own tales. Important: Relevance and chronology (even where the story moves back and forth in time) are essential and are only ignored at author’s peril; readers are easily put off if they discover any note of insincerity or an attempt to manipulate or there is timeline confusion. There are some authors, and a few of those who refer to themselves as writing professions or experts, who suggest, or in some instances categorically state, prologues are unnecessary. They, bluntly sometimes, declare the additional information, details, background, etc. should be included in chapter one, or in other parts of the text, rather than in a prologue. However, it must be argued this is not always appropriate because following this ethos could result in a hiatus for the reader e.g. where the tale does not naturally flow from the initial event into the body of the story. Naturally, if the inclusion of such information within the body of the text would not hinder flow nor confuse the reader, it is preferable to include it there e.g. chapter one. Prologues are simply a tool to help the author and reader where information does not easily fit into the manuscript. As with many aspects, the author has to decide for themselves. As with most things, there are principles authors should observe and adhere to when drafting prologues. Conciseness: The prologue should be designed to lead the reader into the story. By nature it should be brief and to the point. Limit: Not to include information which could be easily and effectively incorporated into the body of the manuscript. Spoilers: Care should be taken not to reveal too much; not to undermine the tension; not to give answers to problems encountered in the tale; etc. Most of this is self-explanatory but may easily be forgotten. Relevance: Many readers admit to consistently skipping prologues and other front matter. Authors need to ensure readers are able to immediately see the prologue is relevant to the story they are about to read. This will not be achieved if the terminology and style appear boring: in principle the text and style of a prologue should be similar, if not identical, to those of the main manuscript. Prologues, in the right circumstances, are a useful tool. Nonetheless, it is necessary to take into account modern attitudes, expectations and habits. Many readers, and authors, no longer consider prologues relevant or desirable. As already pointed out, many skip over front matter material, including prologues. Where an author concludes a prologue is appropriate, they must bear in mind the necessary constraints, some of which have been indicated above. It is vital authors accept where information and details may be effectively incorporated into the body of a manuscript, they are! It helps no one to add unnecessary elements which will only distract and take away from the book as a whole and consequently diminish the readers experience.